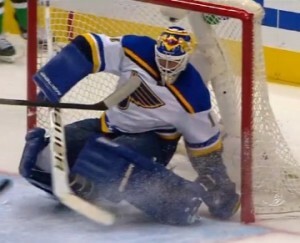 Brian Elliott makes one of his 40 saves. Radek Faksa scored with 4:44 left in the third period to give the Dallas Stars a 2-1 win against the St. Louis Blues in Game 1 of the second round at American Airlines Center on Friday. Blues goaltender Brian Elliott stopped Ales Hemsky on a 3-on-2, but Faksa buried in the rebound for his second goal of the playoffs. The Blues started the game well and picked up their play midway through the third period after Elliott kept the Blues in the game during the second period. Dallas outshot St. Louis 31-17 in the first two periods. Kevin Shattenkirk tied the game 1-1 with 8:28 remaining in the third period after he buried a one-timer past Stars goalie Kari Lehtonen. Shattenkirk took the pass from Colton Parayko. Game 2 is Sunday at 2 p.m.